One of the most historically significant buildings in Los Angeles, the newly restored Art of Living Center also serves as a popular location for film and television. This unique structure consists of four distinct levels that provide a variety of sets in one location. Finished in 1908, the building expresses the beauty of a grand church without the symbolism of one. This allows for a greater range of appearances, including court house, opera house, museum, government and assembly buildings, commercial and office buildings, estate grounds, etc. The main hall provides a general seating of up to 700 made of pews carved from single pieces of mahogany, and a preferred-seating area of up to 300. Rising ninety feet above the auditorium floor, the dome creates an encircling grandeur over a spacious and fully restored interior. 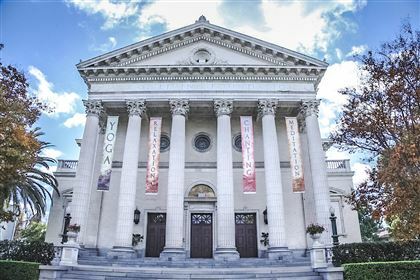 Other unique offerings include: A yoga hall with original hardwood flooring that seats 450 and hosts events from receptions and galas to yoga workshops; An additional second-story house (3600 SF) that includes an industrial kitchen, a yoga studio, bedrooms, office space and a 100-space parking lot; Rare pipe organs; Outdoor sitting space in a shade garden and a vegetable garden. Architectural detail throughout the building's interior and exterior includes: large Grecian columns, vaulted ceilings, dormer, casement and arched windows, colonnade supporting peaked roof, original brick, stucco, concrete, terracotta, and a high copper clad dome (then the world' s largest poured concrete dome), wood paneled walls and tiled floors and a historic wood paneled interior elevator. . Click here for additional info.